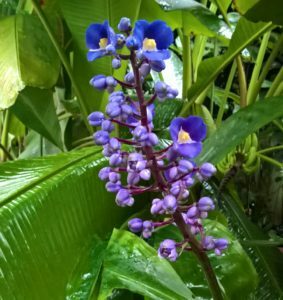 Wayne’s favourite plant of the month is Dichorisandra thyrsiflora. This is a relative of Tradescantia and is a tropical perennial from South East Brazil. Growing to a metre or more in height, it has exquisite deep blue flowers and long narrow leaves. It prefers a shady, moist and humid tropical environment. See it in our Tropical House now.